Continuing around to the board, in the rear corner of the room, was the control rack. This odd homemade structure contained the necessary accessories and equipment for broadcasting the WPSC-FM signal. From top down: Modulation Monitor, Emergency Alert System, Transmitter Remote Control, Aphex Compellor, TASCAM DAT Recorder (for pre-recorded programs), TASCAM Cassette Deck (for recording airchecks) and TASCAM 2 track reel-to-reel deck (for recording phones and news feeds). The lower section had some additional equipment, including the master in line patch bay, 8 second delay unit, equalizers, distribution amps, and the like. 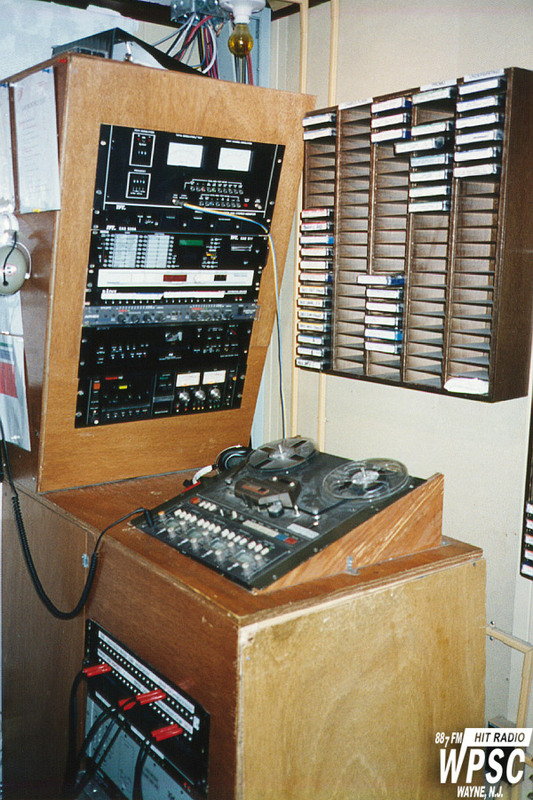 The cart rack above the reel-to-reel deck held all of the current PSAs, Underwriting, and Show Promos.